For the past 6 months or so, I have been struggling with breaking out. I have never really had issues with my face so this is something I wasn't used to. I was buying everything and anything that said it would work for acne, getting facials regularly and nothing was really working. I went to the doctor for my annual and she said a lot of it is hormonal because I turned 30 this year so maybe getting on birth control would help. A long with getting on birth control, there are few other things that are finally getting my face under control. -Water: I went back to drinking at least 6-8 bottles of water each day. It is helping tremendously! Whenever I don't drink enough water, I can see the evidence in my skin. -Birth Control: I have only been back on birth control for the past 7 days but I already see a difference. I haven't really had any new breakouts. I know my hormones are severely out of wack due to age and also from competing. I went on a high level of estrogen to help both with my skin and to help balance my hormones for weight loss as well. -Hydrocortisone and a jade roller: When I went to get a facial the last time, the esthetician recommended using hydrocortisone on the bumps and then doing a facial massage with a jade roller Hydrocortisone can be found at any drugstore and it is an anti-inflammatory agent, so using that along with the cooling properties of the jade roller helps reduce the inflammation that is causing raised bumps on your face. -Murad Rapid Age Spot and Pigment Lightening Serum: I have been using this as a spot treatment on any dark spots I have from former pimples that I had extracted. It is helping so much. I was so worried that all these dark spots on my face were going to be permanent but after using this for two weeks most of the spots are already gone. Just be careful to only put it on the spots because it will lighten the area you put it on. -MaryKay Clearproof Acne Wash: This face wash has 2% salicylic acid in it. It keeps my pores clear without drying out my skin. My mom sells Mary Kay so I can get these cleansers from her but you can get it online or from any Mary Kay sales person you know. 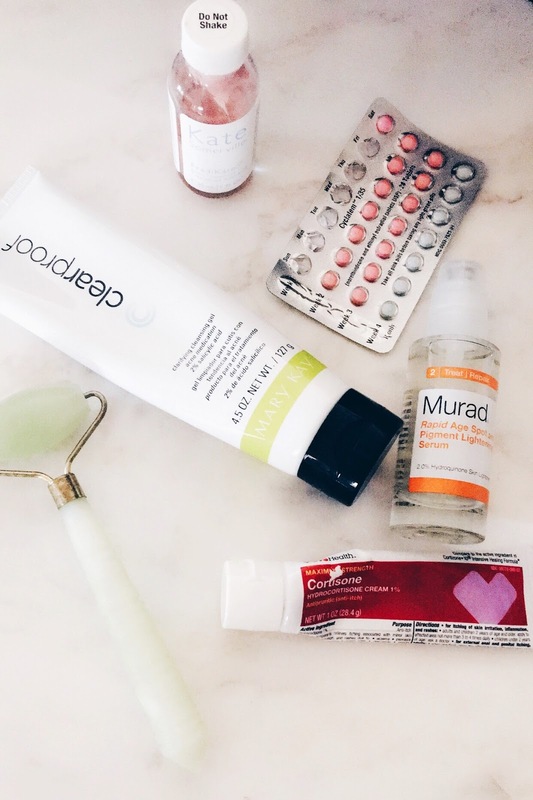 -Kate Somerville Eradikate: This is a acne spot treatment similar to the Mario Badescu drying lotion (but much cheaper and found at Sephora). It has a clear liquid on the top layer and a pink layer at the bottom that has calamine lotion in it. You aren't supposed to mix or shake them together. You just stick your q-tip through both layers and place it on currents spots you have on your face. It dries up the bumps overnight. Small bumps will be gone in a night and bigger bumps will take a little longer. It works really well. I hope these products, help your skin too! Have a wonderful weekend!! Sheri hello..I'm 51 years old and my skin is clear and I break every now and then not much..Now: I take biotin because my hair is long and that's (1)break out on my face..(2).I drink water and add (lemon juice) that's another breakout....and after I stop my skin clears....I don't use different products on my face...I just use plain BLACK SOAP and people tell me my skin looks nice....remember lemons break you out..but I love lemonaide..cleansing and getting ride of belly food...��...but that's. All just thought I let you know.